HERE TOGETHER FOR THE FIRST TIME ARE 10 OF THE MOST GROUNDBREAKING MUSIC VIDEOS OF ALL TIME! EXPERIENCE HIS UNFORGETTABLE MUSIC AND VISUAL IMAGES, FROM THE HORROR MOVIE MAGIC OF THRILLER TO THE MORPHING MIRACLE OF BLACK OR WHITE! BILLIE JEAN ~ FROM THRILLER, THE BIGGEST SELLING ALBUM OF ALL TIME, THIS SHORT FILM EXPOSED MUSIC VIDEO AS A TRUE ART FORM. 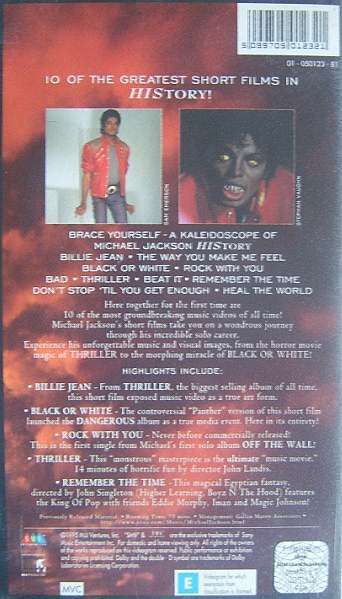 BLACK OR WHITE ~ THE CONTROVERSIAL "PANTHER" VERSION OF THIS SHORT FILM LAUNCHED THE DANGEROUS ALBUM AS A TRUE MEDIA EVENT. HERE IN ITS ENTIRETY! 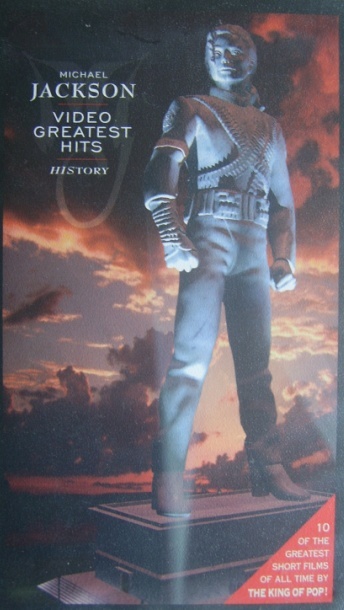 ROCK WITH YOU ~ NEVER BEFORE COMMERCIALLY RELEASED. THIS IS THE FIRST SINGLE FROM MICHAEL'S FIRST SOLO ALBUM ~ OFF THE WALL! THRILLER ~ THIS "MONSTROUS" MASTERPIECE IS THE ULTIMATE "MUSIC MOVIE" ~ 14 MINS OF HORRIFIC FUN BY DIRECTOR JOHN LANDIS! REMEMBER THE TIME ~ THIS MAGICAL EGYPTIAN FANTASY, DIRECTED BY JOHN SINGLETON (HIGHER LEARNING, BOYZ N THE HOOD) FEATURES THE KING OF POP WITH FRIENDS EDDIE MURPHY, IMAN AND MAGIE JOHNSON!